Posted on March 17, 2014 | by karenmeetsworld | Category: Oh My K! 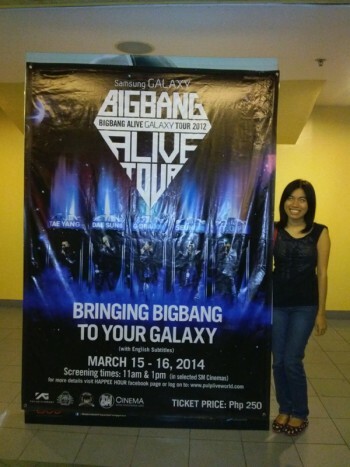 I was one of those girls who got upset because I wasn’t able to watch Bigbang’s Concert Live in Manila, but I’m also one of those girls who felt happy because I am able to watch Bigbang Alive Galaxy Tour Concert in Cinema! The Bigbang Alive Galaxy Tour Concert is a K-Pop concert movie featuring Bigbang’s hit performances in 12 countries. This is I think, the first K-Pop concert movie to be screened here in the Philippines, brought to us of course by Samsung Galaxy, YG Entertainment, and SM Cinemas. It was screened only for two days, so, imagine VIP’s anticipation to the concert movie. And believe it or not, getting the tickets to this concert movie was harder than I thought it would be. It’s like praying every minute that a single ticket will not be sold out, because out of a thousand tickets, only 200 tickets were left. I even called someone from SM Cinemas to reserved me two tickets on the very first day it will be screened and I’m glad to have it. 🙂 Hey! It’s “Bigbang”! Everybody loves them. We sat in the middle row seat near the screen feeling like a VIP watching on 3D. haha It was my first time to watch a K-Pop concert on BIG SCREEN so might as well get the best seat. They were viewing 2ne1’s AON Concert Promotion video and some of Bigbang’s endorsements while people were waiting for the real movie concert. Eventually, “Tonight” started to play and we started screaming our hearts out. Literally, my jaw dropped when the VIPs’ turned on their yellow light sticks, waving it throughout the concert movie. I feel like I am in a real Bigbang Concert. It was amazing! Everyone has full of energy. VIP’s on the upper box seats also dance with “Fantastic Baby”. And the guards were not confronting us for being so noisy and loud. Oh Yes, WE CAN BE THAT LOUD!!! 🙂 We were really screaming names and shouting in “aww” when they focused each Bigbang members. We even sing with them in the performance. How awesome is that right? Bigbang performed 18 songs namely: Tonight, Fantastic Baby, Stupid Liar, Crayon, High High, Strong Baby, Bad Boy, and among others. And in all these performances, you can see how well-crafted it was. The frame transitions of each songs was marvelous: the music pitch, movement timing, and song bandwidth were perfectly aligned. My favorite performances were Crayon, Bad Boy, Love Song, Lies and Only Look At Me–Wedding Dress. Actually, I thought I’m gonna cry again with Haru-Haru, but, thank God, I am too overwhelmed with the show. (Note: When I first watched the MV of Haru-Haru without any lyrics at all, I cried. I don’t know why. I don’t even understand what are they talking about because I have a zero knowledge in their language. My tears just started to fall down as I watched it. I find the story sad especially on G-Dragon and the girls’ part). They also showed us behind the scenes to their concerts. I love how Bigbang value their fans, they even read fan letters when they were backstage and sincerely thanking us(fans) for our support. Seeing such small gestures means a lot to us VIPs’. Bigbang’s humility and passion to their music is what keeps them on top. Bigbang Alive Galaxy Tour was a BLAST. Even though it’s a bit “BITIN“. I WANT MORE!!! But, I guess I have to wait for a YG family tour concert here in the Philippines. That, I won’t let pass, since I know that when YG gives us a concert, every cents that we will be paying will be worth it. YG artists always give us more than a 100% performance. We feel like eating Korean food after watching Bigbang’s concert movie. So, we ate bibimbap and bulgogi kimbap at MR. KIMBOB. Their regular plate is good for two persons and the price is very affordable. I think it’s around Php 250.00. If you want to taste Korean Food within a budget, you can try MR. KIMBOB.